Fire TV Stick and Roku Streaming Stick also acknowledge the need for strong wireless streaming signals, since both are equipped with dual-band, dual antenna MIMO-compatible Wi-Fi, while Chrome cast limps along on a single band of 2.4GHz 802.11b/g/n alone. All three devices are capable enough of streaming up to 1080p HD, while Fire TV Stick and Roku Streaming Stick are noteworthy for supporting audio pass through of up to 7.1 surround channels, while the former adds Dolby Digital Plus certification. And if it is not that clear, all three streaming sticks require an available HDMI port for use, along with AC power supplied by the micro-USB port on the opposite end; it’s kind of the Achilles’ heel of these demonstrations instead. When everything is said and done, still it has been widely preferred the Chrome cast for a more unique design. Last year, Google Chrome cast looked like an unbeatable value at only $35 (UK£30, about AU$39), but then Roku came along with its own Streaming Stick for only $49 (about UK£31, AU$56), which included a dedicated hardware remote control. And now, Amazon has decided to stick the Fire TV (pun intended) squarely in the middle of this streaming war by pricing the device at only $39 (about UK£31, AU$44) – and early adopters who also happened to have Amazon Prime accounts were able to score one for even cheaper (only $19) for the first few days. This one is a bit of a toss-up: While checking out the theoretical part, Fire TV Stick comes off as the best value, but for only $10 more, buyers can get way more content from Roku – so this is of course a tie, unless you’re a casual gamer, and then Fire TV Stick is likely to be a better investment in the long run. Google Chrome cast is looking more and more like a niche player now that the original streaming dongle is being squeezed at both ends by larger, more established players. 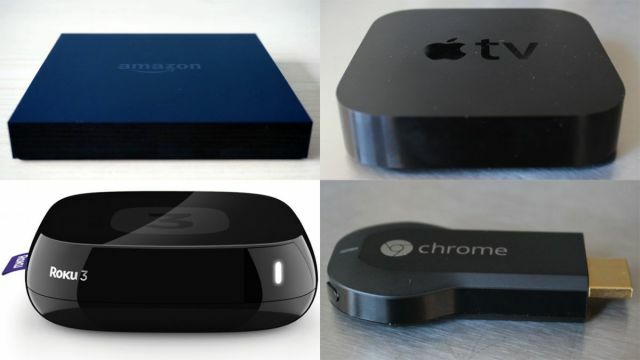 It doesn’t help that Google has a somewhat checkered history when it comes to streaming devices (Nexus Q, Google TV), although for compatible apps, it is a pretty nice choice. With great designs and amazing interface, it is definitely the one you would need. So, it has noted that Roku devices tend to be on the underpowered side, which is causing them to reveal kinks in the armor more easily when using resource-intensive channels like VUDU, and the Streaming Stick is already less powerful than Roku 3 in order to begin with. Here the market has been assuming that Amazon can get its act together on the content and user interface side. Therefore ultimately, Fire TV Stick has a pretty good shot for long-term survival when it starts arriving on November 19 – and if nothing else, the dirt-cheap price makes a great impulse buy that’s likely to retain its value longer than Chrome cast or Roku Streaming Stick.